I finally did some sewing. I've wanted to make one of these ruffle tops since last year, but my time management skills are lacking. I'm not sure how I feel about the color, but it's cotton so I can dye it if I want to later. It was super easy to make. I used one of the hundred tutorials on Pinterest but can't remember which one exactly. Now I'm going through my fabric stash to make a couple more! Mother's Day was yesterday. 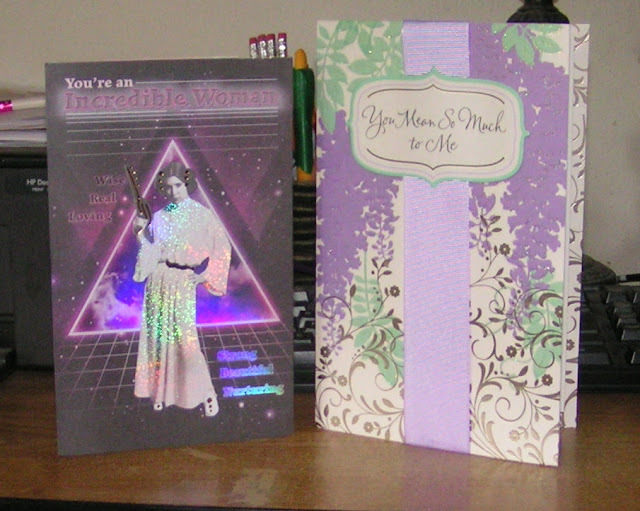 Look at the great cards I got! Khloe went the sweet route. Eric knows my geeky heart. The two latest Star Wars movies have really reawakened my love for the series. I saw the original movie when it came out and had a tee shirt and Chewbacca action figure (don't know where he went). I put my sci fi love on the back burner for a long time, but now I'm in a place where I can be as much of a fan as I want. Last night, on my way home from work, I saw a woman walking her dog. Not unusual, of course, but I took a second look and saw that she was walking a big orange cat! It's the first time I've seen that around here. Khloe wants to walk Joshua and Buffy, but they aren't too thrilled with the idea. Buffy flopped flat on the floor when Khloe put a harness on her. She's such a dramatic kitten. That's it for today. Have a great week! We had an elderly man that walked a Siamese cat on a leash when I was a child in Chicago. Haven't seen that since. The top looks brilliant and I really like the colour! The cards are super! Star Wars is great!